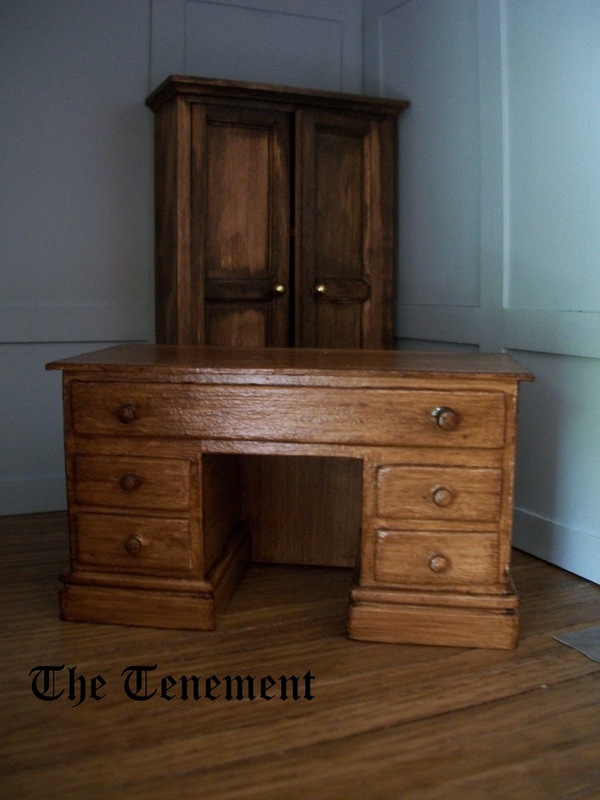 Things are moving along in the Lawyers' Room of The Tenement. He now has painted and panelled walls, a fixed floor and some furniture. As the space is quite tight at the front of the room where the fire is situated I decided to make my own surround. Pretty straightforward really - an assortment of wood suitably arranged, some cornice with an added shelf to create the mantelpiece and all painted in my favourite metal coat enamel paint. Then I thought, I'll make the grate too - again using bits of wood and kebab sticks and painted with the metal coat paint. The piece de resistance though just has to be the coals. I spotted this idea on Elizabeth's blog Studio E who spotted it on the Dangerous Mezzo's blog The Tudor/Medieval House so big thanks to both of you. What a great idea and it works wonderfully well. We don't get orange TicTac boxes here but no matter, it was a simple enough job to cut the clear box, add three coats of glass paint, and cut a little nick to take the bulb wire. I already had some coals from another long ago project and just stuck them on randomly. Also in the stash was a bulb complete with wire and socket. Brilliant! I then had a go at making him a chaise. Again, suitably sized pieces of wood and bits of spindles all upholstered in grey/blue silk with added tassels for detail - handmade tassels too (I'm really getting into this diy lark!). Unfortunately, I was careless enough to get a bit glue on the silk but that will be covered with a throw of some description, so all good! As I was pleased with the mountboard desk in my Green Room, another desk was made for here. Nothing tricky, no opening drawers but it does the job. The next task is to add the wall lights and fix in the walls permanently. That will allow me to add the cornice and his chandelier. The windows still have to be dealt with and curtains made. I think that's enough to keep me out of mischief for a while! How wonderful. I am impressed by your furniture. the finishes are wonderful and so well made. 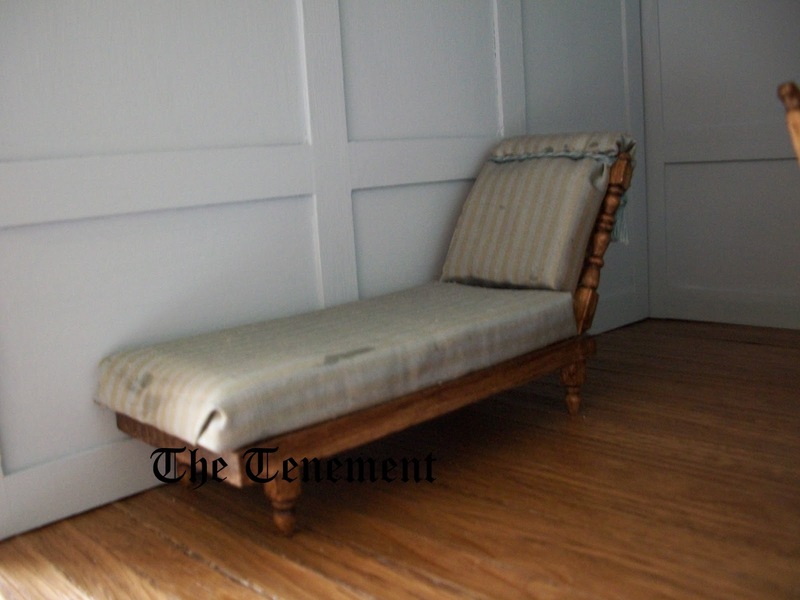 the chaise is beautiful. I always get a little glue on fabric when I upholster, so I feel your pain. The room is going to be fantastic. the fireplace is just great. Excellent work. Hello Irene! 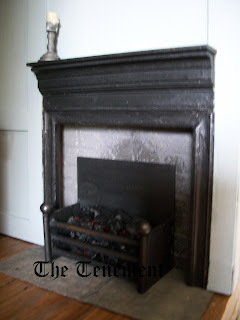 Love the coal fire! Yours turned out So WELL and it just goes to show how necessity is the mother of invention! There are always solutions when you have to make it work! I love the finish on the fireplace surround and the furniture is wonderful! If you hadn't said what they were made of then I would never have known that it wasn't fine wood! You have finished them beautifully! What a drag about the glue on the silk but I think that your solution of a throw is a good one. You are on a roll, Irene. Keep your drive alive! Hi Irene! You are on a roll! 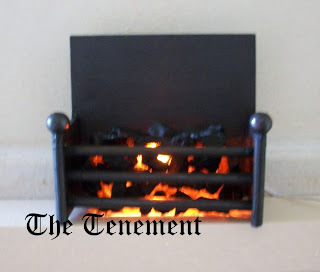 That is a Gorgeous fireplace and the coal grate looks so realistic! I think I will have to find some of this "metal paint"! And I think having a few "rough edges" on the furniture only makes it more realistic! 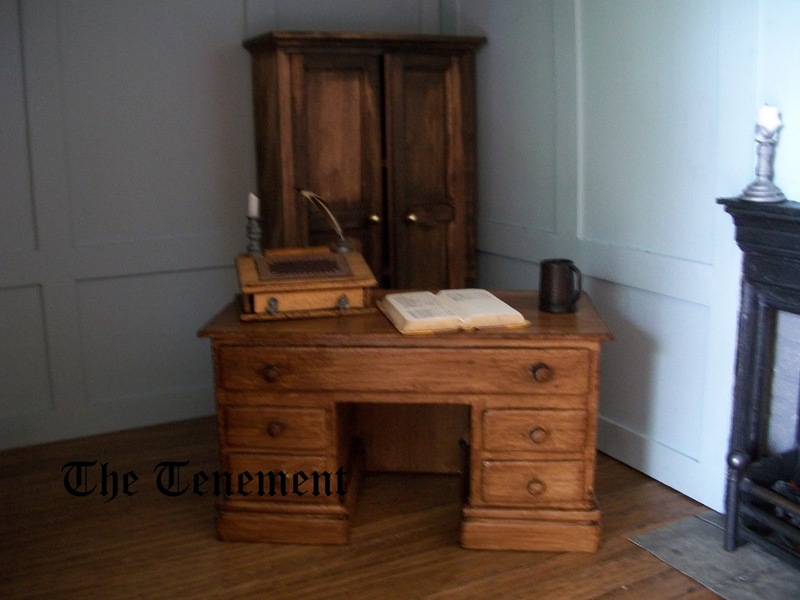 I look forward to seeing more of this fascinating Tenement room! I love all you've done Irene, the fireplace and coals are perfect, the furniture is just amazing, love the chaise. Such ingenuity, will enjoy seeing what comes next. It all looks fantastic, well done. I love the chaise and desk, and the coals are a triumph! I also love your panelling. I can't wait to see what you do with the wall lights. Well done, Irene - I would never have known the fireplace was homemade! 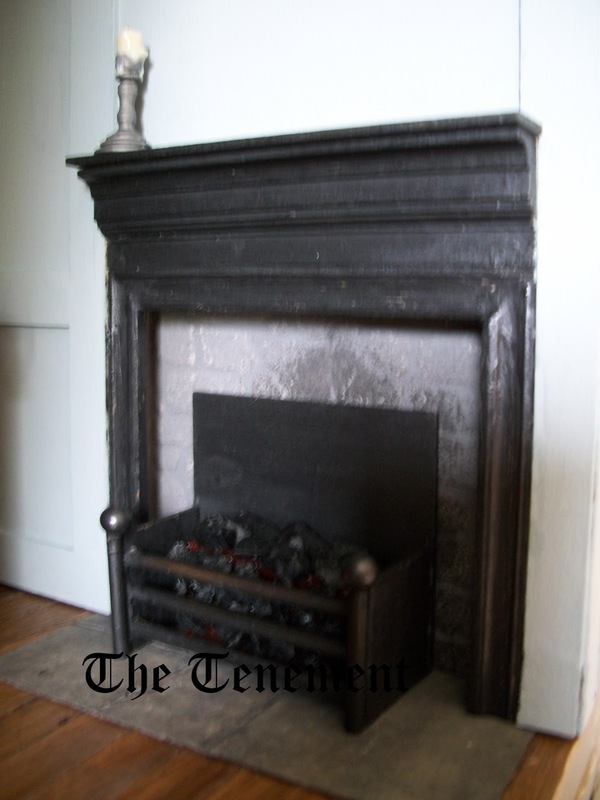 It looks so much like a very old, full-size fireplace. The fireplace looks very professional, like the ones that cost a small fortune! Shows what can be done with some off cuts of moldings, effort and imagination! No less so the fabulous chaise, which looks very comfortable, the glue is a shame, I have done exactly the same myself, but as you say, it can be covered up, and isn't all that noticeable anyway! And the desk too! you are so full of clever, thrifty ideas!! you should write a book!! looks forward to seeing more soon!! Superb work! You're very talented.